Background Ankle sprains are the most common musculoskeletal injuries that occur in athletes. Although often considered minor, they can lead to development of chronic anterolateral soft-tissue ankle impingement. This ankle sprain if left untreated, owing to repetitive actions, can lead to development of thickenings ‘pathological synovial or capsular tissue’ within the ankle joint, which causes persistent painful limitation of ankle movement as a result of entrapment of this pathological tissues in the anterolateral aspect of the joint. As impingement progresses, movements essential to athletes may become impossible; therefore, successful arthroscopic ankle debridement and impinged-soft tissue excision is the procedure of choice, allowing athletes to return fast to their previous preinjury sports activities level. Patients and methods A total of 25 elite athletes complaining of persistent anterolateral ankle pain during sports participation, who were diagnosed by history, physical examination, and magnetic resonance imaging to have anterolateral ankle impingement with unsuccessful conservative management for at least 6 months, underwent arthroscopic debridement and excision of the anterolateral impinged hypertrophic, inflamed, and scarred soft tissue. Any athlete diagnosed to have associated ankle instability or tibial or talar chondral lesion was excluded from this study. Results There were 13 right ankles and 12 left ankles. There were 14 male and 11 female patients. No bilateral cases existed. The mean duration of symptoms till operation was 8.9 months. The mean postoperative follow-up was 15 months. At the final postoperative evaluation, 23 athletes were satisfied and reparticipated in the same preinjury sports activities level without complaints, whereas two (8%) athletes were unsatisfied and retired from high-level sports activities. The mean time to return to full sports activities with high performance was 8 weeks. According to American Orthopaedic Foot and Ankle Society (AOFAS) at the final postoperative follow-up evaluation, nine patients had excellent results, 14 patients had good results, and two patients had fair results. A significant improvement of the AOFAS (P<0.05) was seen at the final postoperative evaluation. Four athletes had reinversion injuries within 4 months postoperatively. Two of them had fair AOFAS results at the final postoperative evaluation. There were no postoperative complications. Conclusion Ankle arthroscopy is a useful and safe method in diagnosis and treatment of anterolateral soft tissue ankle impingement in elite athletes, with early return to full sports activities. Final outcome may be affected negatively with new inversion injuries during the early postoperative period. Ankle impingement was first described in 1942 by Morris  as athlete’s ankle and then described as footballer’s ankle by McMurray . Now, ankle impingement is defined as entrapment of an anatomic structure that leads to chronic persistent pain and potentially decreased range-of-motion of the ankle during activities and can be classified as either soft tissue or osseous . Anterolateral impingement is the commonest soft tissue ankle impingement lesion and is the cause of pain after ankle inversion injury . Ankle soft-tissue impingement usually results from scarring and fibrosis associated with synovial, capsular, or ligamentous injury. Soft-tissue impingement most often occurs anterolateral, anterior, anteromedial, posterior, and posteromedial . This impingement is attributed to initial lateral ankle sprain owing to inversion injuries, which if undertreated, owing to repetitive actions through subacute or chronic overuse during pivoting sports, would lead to development of thickenings ‘pathological synovial or capsular tissue’ within the ankle joint. Soft tissue impingement lesions of the ankle usually occur as a result of entrapment of the pathological tissues in the anterolateral aspect of the joint. The anterolateral gutter of the ankle is bounded posteromedially by the tibia and laterally by the fibula. Anteriorly the capsule of the ankle joint limits the anterolateral gutter and is enforced with anterior tibiofibular, anterior talofibular and calcaneo-fibular ligaments. Symptoms are due to compression of soft-tissues structure during particular movements . Athletes frequently complain about pain, swelling, giving-way, and popping at the anterolateral region aggravated by sports activities ,. As impingement progresses, movements essential to athletes may become impossible, and arthroscopic ankle debridement is often effective for both diagnosis confirmation and definitive treatment, allowing athletes to return fast to their previous preinjury sports activities level . The purpose of this prospective study was to evaluate the results of arthroscopic debridement and excision of an anterolateral soft tissue impingement of the ankle in elite athletes. Between December 2008 and October 2012, 25 elite athletes diagnosed to have anterolateral ankle soft-tissue impingement with failed conservative management for at least 6 months underwent arthroscopic debridement and excision of the anterolateral impinged hypertrophic, inflamed, and scarred soft tissue. All athletes were carrying out high-performance sports activities defined as participating in competitive sports held by the Egyptian Olympic Federations ([Table 1]). All athletes were complaining of residual persistent anterolateral ankle pain during their sports activities following an initial ankle sprain or repetitive ankle inversion injuries. The performance of sports activities among all patients deteriorated dramatically owing to chronic ankle pain and/or a ‘giving way’ feeling. Diagnosis was achieved clinically by history and physical examination, and confirmed radiologically by MRI and during arthroscopy. The most frequent preoperative findings were tenderness localized to the anterolateral aspect of the ankle, swelling, and crepitation. All athletes underwent the same procedure by the same physician. Any athlete diagnosed clinically or radiologically to have an associated ankle instability was excluded from this study. Any case detected during arthroscopy to have a bony cause of impingement or detected to have tibial or talar chondral injury was also excluded from this study. All patients underwent the same arthroscopic technique under general anesthesia or spinal anesthesia with sedation. A tourniquet is applied to the leg with the patient supine on the operating table. After the foot and ankle are appropriately positioned, at least two portal incisions were placed for the arthroscopic camera and instrument. The camera and instrument can then be exchanged between portals to perform the surgery. A complete diagnostic arthroscopy was performed to ensure a thorough examination for intra-articular pathology ([Figure 1]a and b). Partial synovectomy, extensive removal of all fibrous adhesive bands, excision of any soft-tissue impingement lesions, and anterior capsule-ligamentous structure release were performed corresponding to the same location as the preoperative tender spot. The synovial impingement was noted to be the most recorded factor. These procedures were done with a full-radius shaver in conjunction with arthroscopic ronguers and different suction or basket punches ([Figure 1]c) The wounds were closed with strip plasters. Figure 1 (a) Meniscoid-like lesion. (b) Synovial hypertrophic tissue. (c) Intraoperative impinged tissue shaving. Postoperatively athletes were placed in an ankle splint for only 1 week. They were instructed to start partial weight bearing immediately with crutches till full weight bearing was reached within 2 weeks. Then, initial physiotherapy began with gentle range-of-motion exercises for the ankle and toes. The first few physical therapy treatments were designed to help control pain and swelling from the surgery. Ice and electrical stimulation treatments were used. Active ankle exercises were started at 3 weeks postoperatively. Sense of position exercises and sport-specific rehabilitation exercises were initiated at 4 weeks postoperatively till return to the normal level of sports activities. All athletes were routinely examined clinically preoperatively, then at 2 and 6 weeks, and then every following month till the 6 months postoperatively. Follow-up continued between 12 and 18 months postoperatively. Careful and detailed history including the etiology was recorded. Clinical signs, symptoms, and activity level were noted preoperatively and during follow-up. Functional outcome of all patients was evaluated by using the criteria established by the American Orthopaedic Foot and Ankle Society (AOFAS) ankle-hindfoot scoring system , preoperatively and then after 6 and 12 months postoperatively. The ability for postoperative participation in high-impact sports and returning to the preinjury activity status was also recorded at the final postoperative follow-up evaluation. At the final follow-up evaluation, all patients were asked whether they were satisfied or not satisfied with the results of the surgical operation. Statistical analysis of the results including mean and SD values was performed using ‘SPSS version 16’ (SPSS Inc., Chicago, IL, USA) computer program. Differences were considered statistically significant at P value of less than 0.05. There were 14 male and 11 female patients. There were 13 right and 12 left ankles, with no bilateral cases. The mean time between complaint/diagnosis and arthroscopic surgery was 8.9 months. Among 25 athletes reviewed at the final postoperative evaluation at 1 year, 23 (92%) athletes showed no change in the results than that detected at 6 months postoperatively. Only two athletes had improvement from fair to good AOFAS results at 6 months postoperatively. These athletes had new inversion injuries during sports activities at 4 months postoperatively. The mean postoperative follow-up was 15 months (range: 12–18 months). Their average age at the time of arthroscopy was 22 years (range: 16–28 years). At the final postoperative evaluation, 23 (92%) athletes were satisfied, whereas two (8%) athletes were unsatisfied. Moreover, 23 athletes returned back to participate with their normal sports activities level without complaints, and only two (8%) athletes had some limitations of their sports activities, so they retired from high-level sports activities. The mean time to return to full sports activities with high performance was 8 weeks. According to AOFAS at the final postoperative follow-up evaluation, nine patients had excellent results, and 14 patients had good results, whereas two patients had fair results. No postoperative complications were detected. Intraoperative arthroscopic findings showed that the impinged soft tissue is variable ([Table 2]). The mean preoperative athletes assessment with the AOFAS score was 53 (range: 40–65). At the final postoperative follow-up evaluation, nine athletes had excellent results, 14 athletes had good results, and two patients had fair results ([Figure 2]). Figure 2 Postoperative American Orthopaedic Foot and Ankle Society (AOFAS) assessment results at final postoperative evaluation (excellent: 100–91; good: 90–81; fair: 71–80; poor: <70). The mean postoperative AOFAS score was 89 (range: 75–100), with a significant improvement (P<0.05) at the final follow-up assessment ([Figure 3]). Figure 3 American Orthopaedic Foot and Ankle Society (AOFAS) assessment chart (mean score with significant improvement postoperatively). Four athletes had reinversion injuries within 4 months postoperatively. Their AOFAS was between 70 and 75 at the 6 months postoperative follow-up evaluation. All had improved results with rest and prolonged physiotherapy. Two of these athletes had good AOFAS results (81 and 84 scores), whereas the other two, although improved, remained with fair results at their final postoperative follow-up evaluation (75 and 78 scores). It has been statistically shown that repeated inversion injuries had negative effects on final clinical results. Twenty-three athletes were satisfied from the procedure, whereas two athletes were unsatisfied ([Figure 4]). These two unsatisfied patients were the same athletes with fair results who did not return to the preinjury sports level activities. There were no (0%) complications detected. Figure 4 Subjective evaluation: 23 patients were satisfied whereas two patients were unsatisfied at the final postoperative evaluation. The ankle joint is the largest bearing hinge joint and is prone to injury during sports activities. When the inversion ankle sprain occurs, the vulnerable lower tibiofibular ligament and anterior talofibular ligament tear might occur. As a result, the fibrosis scar formation would be induced later that might interfere with the motion of ankle joint and aggravate painful dysfunction ,,. Ferkel et al. estimated that among athletes treated for ankle sprains, ∼2% developed anterolateral impingement of the ankle. Various intra-articular soft lesions have been described in association with anterolateral ankle impingement ,,,,,. It includes scar tissue of the synovium, a meniscoid-like lesion associated with focal synovitis in the anterolateral recess, irregular thickening and scarring of the distal fascicle of the anterior inferior tibiofibular ligament, or the presence of plicae or a synovial band associated with adjacent synovitis in the lateral recess. In this study, synovial hypertrophy was found in 19 athletes, meniscoid-like lesion in four athletes, and impinging distal fascicle of the anterior inferior tibiofibular ligament in two patients. The main advantage of arthroscopic technique in athletes is their fast return to full sports activities. In this study, athletes were allowed to return to sports activities as tolerated as possible, depending on the completion of physical therapy goals. The physiotherapy goal was to help in pain control, improve range of motion and maximize muscle strength, and control stable ankle during activities. Athletes generally advanced quickly in rehabilitation and resumed normal activity fast. The mean time to return to full sports activities with high performance was 8 weeks. This showed significant favorable difference than that of open arthrotomy ,,. Coull et al. reported on 27 patients with anterolateral ankle impingement who were treated with an open procedure. Their patients were able to return to sports at a competitive level at 13 weeks postoperatively. According to AOFAS at the final postoperative follow-up evaluation, nine patients had excellent results, and 14 patients had good results whereas two patients had fair results. 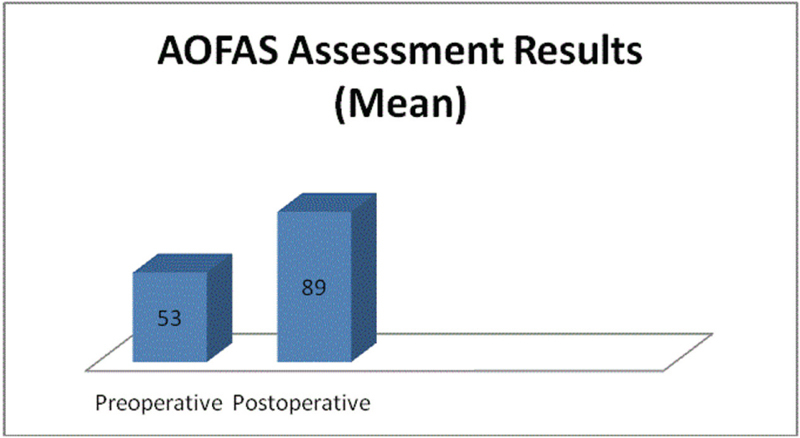 Preoperative AOFAS was average 53 (40–65) points and after the operation 89 (70–100) points. Arthroscopic debridement of impinged soft tissue resulted in improved articular function in 100% of patients with functional deterioration of the ankle joint before arthroscopy. Koczy et al. found that the mean preoperative AOFAS score was 75.4 points. Postoperatively, the AOFAS functional scores increased to 90.6 and 92 points in the third and 12th month after the procedure, respectively. In this study, four athletes had reinversion injuries within 4 months postoperatively during participation in sports activities. They had fair AOFAS at 6 months postoperative assessment. Two of them had improved results owing to rest and prolonged physiotherapy. They had good AOFAS at the final postoperative evaluation, whereas the other two athletes remained with their fair AOFAS results at the final postoperative follow-up evaluation. It has been statistically shown that repeated reinversion injuries during the early postoperative period had negative effects on clinical results. No intraoperative or postoperative complications (0%) were detected.In this study at the final postoperative evaluation, 23 (92%) athletes were satisfied. 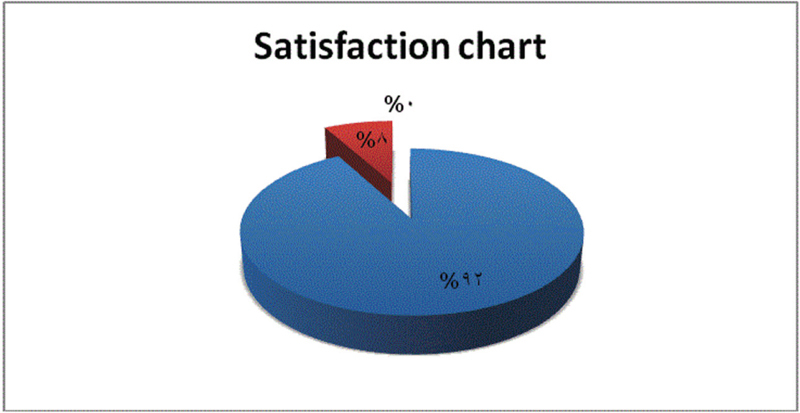 This is compared favorable than that reported in open surgery, with 66% satisfaction . It is also compared favorable than that reported by Tol et al. who found satisfactory results in 77% of patients managed with arthroscopy, but the cause of impingement was osseous. This study agrees with other studies , that surgical technique possesses the advantages of less morbidity with fewer invasions, less blood loss, and clear appearance of intra-ankle pathological changes. Intraoperative examination through arthroscopy could be recorded, which would be helpful for patients to understand the disease, and to conform to regular functional exercise postoperatively. The arthroscopic debridement and excision of the anterolateral ankle soft tissues impingement in elite athletes is a safe, good, and effective method in diagnosis and treatment with fast return to full sports activities without complications. Final outcome may be affected negatively with new inversion injuries during the early postoperative period. Morris LH. Report of cases of athlete’s ankle. J Bone Joint Surg 1943; 25:220–224. McMurray TP. Footballer’s ankle. J Bone Joint Surg 1950; 32:68–69. Bassett FH 3rd, Gates HS 3rd, Billys JB, Morris HB, Nikolaou PK. Talar impingement by the anteroinferior tibiofibular ligament. A cause of chronic pain in the ankle after inversion sprain. J Bone Joint Surg Am 1990; 72:55–59. Wolin I, Glassman F, Sideman S, Levinthal DH. Internal derangement of the talofibular component of the ankle. Surg Gynecol Obstet 1950; 91:193–200. Van den Bekerom MP, Raven EE. The distal fascicle of the anterior inferior tibiofibular ligament as a cause of tibiotalar impingement syndrome. a current concepts review. Knee Surg Sports Traumatol Arthrosc 2007; 15:465–471. Ogilvie-Harris DJ, Gilbart MK, Chorney K. Chronic pain following ankle sprains in athletes: the role of arthroscopic surgery. Arthroscopy 1997; 13:564–574. Asık M, Sen C, Bilen EF, Kılıçog lu ÖI, Debre M, Taser ÖF. Arthroscopic treatment of anterolateral impingement of the ankle. Acta Orthop Traumatol Turc 2001; 35:140–146. Ferkel RD, Karzel RP, Del Pizzo W, Friedman MJ, Fischer SP. Arthroscopic treatment of anterolateral impingement of the ankle. Am J Sports Med 1991; 19:440–446. Molloys S, Solan MC, Bendall SP. Synovial impingement in the ankle. J Bone Joint Surg Br 2003; 85-B: 330–333. Kitaoka HB, Alexander IJ, Adelaar RS, Nunley JA, Myerson MS, Sanders M. Clinical rating systems for the ankle-hindfoot, midfoot, hallux, and lesser toes. Foot Ankle Int 1994; 15:349–353. Waller JF. Hindfoot and midfoot problems. Symposium on the foot and leg. In: Mack RP, editor. Running sports. St Louis, MO: Mosby; 1982. pp. 64–71. Jacobson K, Ng A, Haffner K. Arthroscopic treatment of anterior ankle impingement. Clin Podiatr Med Surg 2011; 28:491–510. Hamilton WG. Tendonitis about the ankle joint in classical ballet dancers. Am J Sports Med 1977; 5:84–88. Baums MH, Kahl E, Schultz W, Klinger HM. Clinical outcome of the arthroscopic management of sports-related ‘anterior ankle pain’: a prospective study. Knee Surg Sports Traumatol Arthrosc 2006; 14:482–486. Akseki D, Pinar H, Bozkurt M, Yaldiz K, Araç S. The distal fascicle of the anterior inferior tibio-fibular ligament as a cause of anterolateral ankle impingement: results of arthroscopic resection. Acta Orthop Scand 1999; 70:478–482. Kandil A. Open treatment of anterior ankle impingement. Egypt Orthop J 2013; 48:74–79. Coull R, Raffiq T, James LE, Stephens MM. Open treatment of anterior impingement of the ankle. J Bone Joint Surg Br 2003; 85:550–553. Koczy B, Pyda M, Stołtny T, Mielnik M, Pajak J, Hermanson J et al. Arthroscopy for anterolateral soft tissue impingement of the ankle joint. Ortop Traumatol Rehabil 2009; 11:339–345. Tol JL, Verheyen CP, van Dijk CN. Arthroscopic treatment of anterior impingement in the ankle. J Bone Joint Surg Br 2001; 83:9–13. Kim SH, Ha KI. Arthroscopic treatment for impingement of the anterolateral soft tissues of the ankle. J Bone Joint Surg Br 2000; 82:1019–1021. Hassounah H, Kumar S, Bendall S. Arthroscopic ankle debriedment. Acta Orthop Belg 2007; 73:737–740.